Wow. Capcom certainly isn't skimping on the North American Resident Evil 5 Collector's Edition, packed with enough Kijuju-themed goodness to kill a small horse, possibly bringing it back from the dead afterwards. The $89.99 limited Collector's Edition of Resident Evil 5 is now available for pre-order across North America, and as you can see they don't price it that high lightly. First you get the special steel case packaging emblazoned with Kijuju writing, which contains the game and a bonus disc filled with art, trailers, and a making of feature...and that's just the beginning of the box. Along with the steel case, the box also contains a Chris Redfield figurine, a BSAA patch, a Kijuju-inspired pendant, and a lovely Tricell messenger bag to carry it all. I've yet to pre-order my copy of Resident Evil 5 yet, but I've got a funny feeling I might be making a trip to my nearest game retailer this afternoon to put a little money down. Check out the gallery below for more impressive pics. Capcom's Resident Evil 5 Collector's Edition Exposed! Capcom is pleased to announce the Resident Evil 5 Collector's Edition. First teased last week at the Consumer Electronics Show in Vegas, the Collector's Edition will be available on day one of the game shipping Friday, March 13, 2009. Available for only a limited time, gamers will be able to pre-order the collectible set starting today at the Capcom store at www.capcom.com. On launch date, the set will be available at all major retailers in North America with a price of $89.99 for the Xbox 360 and PLAYSTATION 3. For fans of the highly popular series, the box set is not to be missed as it will include a host of never-before-seen collectible items not available anywhere else. 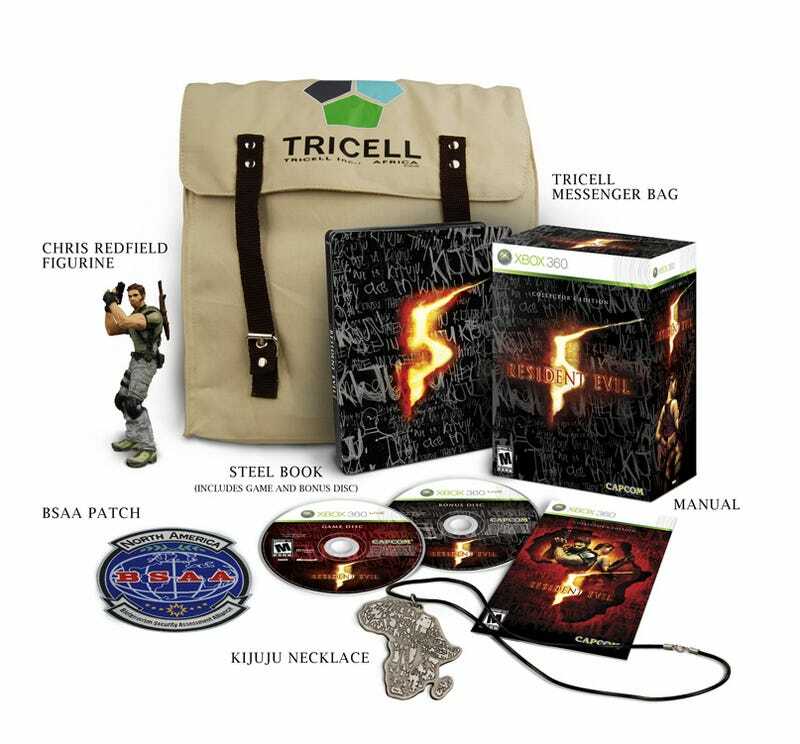 All designed around RE5's Kijuju setting and the game's in-depth storyline, the box will include a Tricell messenger bag, Chris Redfield figurine, BSAA patch and Kijuju-inspired pendant. Bringing the entire collection together is a custom made steel case with special art showcasing signature elements of the RE5 campaign - the Kijuju writings, ominous number five and two-player co-op. Inside the steel case is where the real action lies, with a two disc set including the game and bonus disc with additional special features. The Making of Resident Evil 5 feature, first shown at the Tokyo Game Show, will be released on the bonus disc for the first time. A digital art gallery showcasing the game's incredible HD graphics and impressive art style and a Resident Evil Degeneration Trailer will top off the special features making a bonus disc that is a must-have for all Resident Evil devotees.